As temperatures and the Cache la Poudre River’s waters rise, people should be extremely cautious when recreating near and in the river. 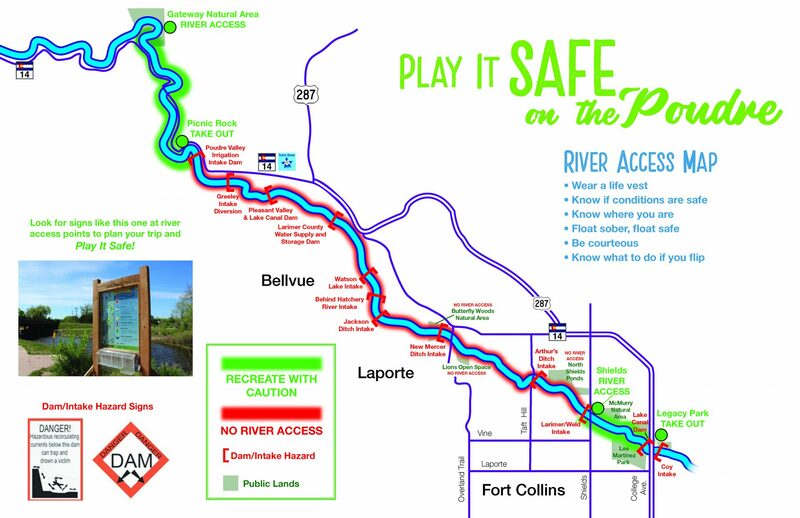 A new river-safety initiative, “Play it Safe on the Poudre,” emphasizes this point through newly installed safety and educational signage along the river, public outreach and other means. The intent is to minimize future Poudre River-related injuries and deaths. In the days after two river deaths in summer 2017, representatives from multiple agencies came together with an impassioned drive to empower people to recreate as safely as possible near the Poudre River. The “Play it Safe” initiative was born. It’s important to note that river-safety work has gone on in our community in past years. “The Poudre River is a source of local pride that draws thousands to its waters each year. We wouldn’t dissuade peoples’ love for it and what it represents. But the river is equal parts beautiful and destructive. Its power is easy to underestimate, and river-related tragedy can befall anyone at any time,” PFA spokeswoman Madeline Noblett said. Representatives who have taken part in the group’s efforts represent: Poudre Fire Authority; multiple departments within the City of Fort Collins, including the city’s Natural Areas Department; Poudre Heritage Alliance for the Cache la Poudre River National Heritage Area; Larimer County; the Larimer County Sheriff’s Office and Larimer County Emergency Services; Colorado Parks and Wildlife; and more. 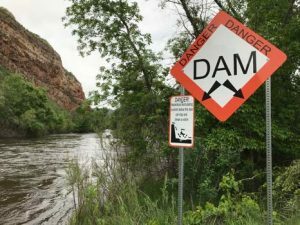 The Poudre River presents numerous hazards. Broken or low-hanging tree branches, hidden beneath the water, can snag a person out for a lazy afternoon tubing trip. Freezing waters made cold by spring runoff can cause a person to react slowly, when quicker action is needed, or possibly suffer hypothermia. And deceptively fast- moving waters pose a drowning risk to even the most experienced swimmers. On June 27, 2017, 64-year-old William McHarg, of Severance, died after falling into the Poudre while he was on a rafting trip. The Larimer County Coroner’s Office determined Mr. McHarg had severe heart disease and died from a heart attack and drowning. Seattle-area 18-year-old Maximilian Gonzalez died after getting caught on June 18 in a low-head dam while tubing near Bellvue. – Installation of warning signs to alert people of the presence of low-head dams ahead. There are numerous low-head dams on the Cache la Poudre River, throughout Larimer County. These structures are installed to slow water to enable diversion of water into ditches. However, the physical drop structure can create dangerous situations for boaters because of their recirculating currents and large hydraulic forces. Though they appear to be smooth and easily traversed in a tube, raft or kayak, they can easily injure and trap people and water vessels. The hope is that people on the river will see the signs and have enough time to get out of the river before they get to the low-head dams. – Installation of signs with river-safety information and maps, including recommendations that people wear river-rated personal floatation devices (PFDs) any time they are near the river; what to do in the event of a river-related emergency; and more. 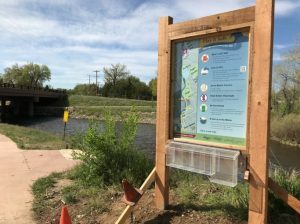 Educational river-safety signage, designed and installed by the City of Fort Collins, sits near a trail by the Poudre River, accessible in the approximate area of 1219 N. Shields St. Location: Adjacent to New Belgium Brewery, 500 Linden St., Fort Collins, on the Poudre River Oxbow River-safety talk/demonstration with PFA firefighters scheduled for 4 p.m.
HuHot will donate 20% of the day’s proceeds to support Larimer County Dive Rescue Team. The money will be used to purchase new rescue equipment for the team. Poudre Heritage Alliance will host a booth on New Belgium Brewery’s lawn to educate the public about and raise funds for the “Play it Safe on the Poudre” initiative. Amy Gonzalez is the mother of Maximilian Gonzalez, an 18-year-old who died in 2017 in a tubing accident. He and his cousin were caught in a low-head dam, near the Bellvue Watson Fish Hatchery. Max later died from his injuries; his cousin survived. Amy wants to make sure that no family has to endure what hers has. She wants people to know Max’s story, and be aware of low-head dams and the risks the river poses. She will be available for interviews from 1:30 to 3 p.m. June 2 at the Poudre Riverfest. She will be at the booths represented by Poudre Fire Authority, the City of Fort Collins Natural Areas, and the Poudre Heritage Alliance. Those who would like to set up a time for interviews may contact PFA Public Affairs and Communication Manager Madeline Noblett (contact info below) ahead of the event. She will not be available for interviews before the event. Through the nonprofit Poudre Heritage Alliance for the Cache la Poudre River National Heritage Area, people can donate to support these and future river-safety-focused efforts. Go to www.coloradogives.org/playitsafeonthepoudre for more information about how to donate. Any questions related to donations may be directed to: Poudre Heritage Alliance at 970-295-4851 or playitsafe@poudreheritage.org. PFA crews were involved with 23 actual rescues (related to the Poudre River or in a canal in PFA’s 235-square- mile service area) between 2013 to 2017. Specifically, this means PFA crews actively responded to an emergency incident, deploying personnel and, in some cases, water craft to rescue people. In some cases, PFA responded but did not perform a rescue because the person self-rescued, or a bystander or other agency rescued the person or people. The first rescue of the 2018 season occurred May 16, when PFA firefighters were dispatched to the bridge in the area of 430 N. College Ave. about 3:26 p.m. A man was stranded on a rock in the river; bystanders reported he had been tubing. Firefighters secured a safety line and launched the rescue boat. The man was safely removed from the river at about 4:50 p.m. He was checked by paramedics on-scene and released. PFA was assisted by partners from Larimer County Sheriff’s Office Emergency Services, UCHealth EMS, Larimer County Dive Rescue, City of Fort Collins Natural Areas Rangers, and Fort Collins Police Services. Have a communication plan in the event of an emergency, not all areas west of Ted’s place have cell service. Wear life jackets around Some areas near the water’s edge and some riverbanks are unstable due to current high-flow rates. Stay away from riverbanks during times of high-flowing The banks may have become unstable and give way underneath you. Watch your surroundings, including the weather. Be prepared for extremes in the weather, especially if more rain is predicted. Heavy rains upstream can alter the water flow and depth in a short period of time and also contribute to When your clothes are soaking wet, hypothermia is a danger even in the summer. If your plans include wanting to be on the river in a recreational watercraft, we urge you to use one of the many qualified local rafting companies for the best experience. They have qualified instructors, safety equipment and trained staff in case of medical emergencies. Additionally, if you are in your own recreational watercraft and it gets away from you, please call our non-emergency Dispatch number at 970-221-6540 to report the watercraft, when it is safe to do so. Have the color, approximate size and the location you last saw it and direction it was traveling so that we are aware of it and can let other concerned citizens who call in and see it know that there is no one trapped underneath the craft.